Settings: Formula 10, Render 2 Orbit Counting, Color 16-2 modified, Julia Mode. 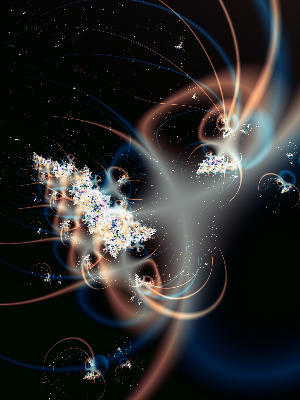 You never know what you'll find deep down in some of these fractals. These wispy, ghost-like shapes appear all over but here I found them floating in a dark "pool" and they suddenly appeared to be in space.